A few weeks ago, I listened to a sermon that dug into the marrow of my soul. The sermon was about the storms of life that come up suddenly — like sudden squalls on a calm lake. The sermon made an impression on me not only because it was a compelling talk and gave a slightly different take on the story of the disciples on the sea, but because it touched off a little warning signal in my spirit. I felt a whisper all around me. Something is coming. Though I am a firm advocate of looking for good and not projecting bad in the future, I also know that sometimes God warns us of things to come. I felt that He was giving me an oh-so-subtle heads up. I buckled down in prayer. I braced myself in spirit for the phone call, the conflict, the problem to emerge. But, as so often happens with God, I got the slow dawning realization that perhaps the storm was one that I was going to have to walk into on my accord. A hurricane wasn’t necessarily going to brew up outside my control and leave me in the middle without a choice (as has often happened). I was going to have to choose to walk into it and trust Him to meet me in it and get me through it. As I have shared many times on my blog, I have been through some healing these past few years — and the end result had been peace. I had set boundaries in relationships that had never been set before. I had made amends and apologies. I had experienced great gains in sifting through emotional baggage and negative unresolved emotions that had built up. But in a way that is His own, God showed me that I was in danger of falling back into some of my old people-pleasing patterns. I had backed away from some confrontations, had remained silent when I should have spoken up. God was prompting me not to lose the lessons He had taught me, but to keep walking head-long into difficult conversations and initiate tough calls as He led me. To stop hiding and being cowardly about facing people. To walk in the power of His Holy Spirit and not backtrack into avoidance and escapism when He directed me to places that were difficult. When evening came, his disciples went down into the sea, got into the boat, and started across the sea to Capernaum. It was now dark, and Jesus had not yet come to them. The sea became rough because a strong wind was blowing. When they had rowed about three or four miles, they saw Jesus walking on the sea and coming near the boat, and they were frightened. But he said to them, ‘It is I; do not be afraid.’ Then they were glad to take him into the boat, and immediately the boat was at the land to which they were going. What is interesting to note here is that Jesus sent the disciples into the boat without Him. He left to go and pray. We must know that there are some decisions we will have to make. He will direct us — but we ourselves are the ones who must choose to walk in that way. He won’t force us. And — even when we do our duty and listen to Christ’s command, we will find ourselves in adverse circumstances, afraid. Many of us assume that doing the will of God will lead us away from difficulty rather than towards it. But as we see in this Scripture, the disciples’ obedience led them straight into a squall. However, just at the right moment, when the storm was reaching a fever pitch and tossing the disciples about — Jesus came to them, walking on the water, saying, “It is I; do not be afraid” (v. 20). As commentator Matthew Henry notes, Jesus walking on the water revealed His complete command over the situation. He walks above our trouble and circumstances and can teach us to do the same. However, as the accounts in Matthew 14:26 and Mark 6:49 relate, the disciples were afraid when they first saw Jesus because they didn’t recognize Him at first. Jesus, to them, looked like some sort of apparition. In the darkness and the winds, they couldn’t make out His face. And perhaps we don’t recognize Jesus in our circumstance at first either. It was only when Jesus spoke that they recognized His voice and invited them into the boat. Again, just as they chose to go into the boat at His command, they also chose to welcome Him into their boat in the midst of the storm. And it was only then that they “immediately” (as the passage says) reached the other side. Was Jesus being merciless, then, by sending them ahead of Him into the boat into the storm? No, not at all. Sometimes, the only way to get to the other side is through an incident than around it. My self-protective tendencies make me want to always look for the easy way, the way where no one gets offended, no one gets upset and no one gets their feathers ruffled. But that’s not always the way Jesus would have me go. Did He send His disciples to die in the middle of the lake? Did He send His disciples to a place He couldn’t see or control? No, He sent them into a storm that He would meet them in the center in, even though it looked, by all appearances, that He would be sitting this one out. 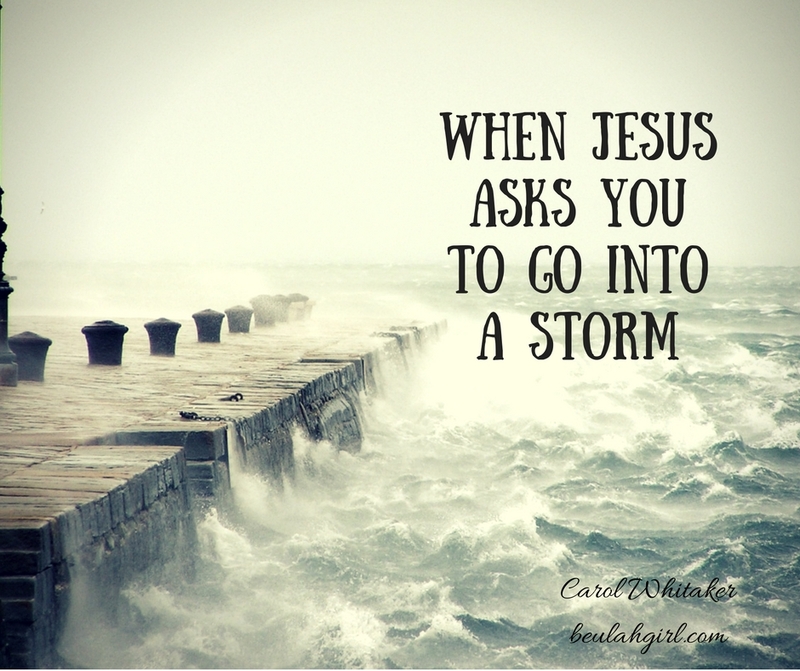 Is God Asking You to Walk Into a Storm? Perhaps God is asking you to do something hard. Confess a wrong to someone else. Confront a friend about a sin. Set a boundary in a relationship where the other person has freely walked all over you for years. Say no to a situation that is tempting you to act in ways you know you shouldn’t. But to do so may mean a storm. It may mean a loss of a relationship. It may mean people mocking you for your beliefs. And you tell God you don’t want to go. You want to stay on the shore. I want to as well, friend. But I know I have to go. So the Holy Spirit and I have been sifting through relationships. I have been consulting Him about what to say, which direction to go. And one by one, as I seek Him and seek His Word, I am launching out in actions that will continue to provide the boundaries around me in relationships, that will help me navigate those in a healthy way with His strategies rather than my own. Is it easy, friend? No, it’s not. His way never is. But is it life-changing. Life infusing? Spirit-dependent living? Yes it is. I urge you — take His invitation. Step out. Leave behind the safe dock and embrace the winds — because it is in the storm where He will meet you. If you would like to join in for a chat about emotional healing and maintaining that healing after you’ve walked through it, I will be talking more about that as well as the inspiration for this post. You can subscribe for free to our live video chat this Monday, August 7 @ 9 p.m. EST, watch the replay, or leave a comment below.